Spatio-temporal pattern formation is a major area of research within the subject of mathematical biology. The topic involves the use of mathematical modelling to analyse how patterns in biology are created and develop. For example, the growth, over time, of the intricate and beautiful patterns on certain sea-shells or the striped markings on a tiger can be modelled and their development predicted in terms of nonlinear mathematical processes. 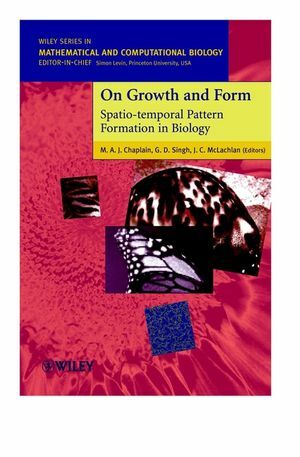 The current volume captures the breadth of recent research into various aspects of spatio-temporal pattern and form, such as development biology, reaction-diffusion systems and morphometrics. Brings the ideas of the classic On Growth and Form by D'Arcy Thompson, the founding classic of mathematical biology, fully up to date and looks to future developments in the subject. * Foreword provided by Professor John Tyler Bonner, Princeton University. Taking its inspiration from D'Arcy Thompson's classic and still influential volume On Growth and Form, this new volume presents a collection of 21 articles from the Plenary Speakers of the recent D'Arcy Thompson Conference, held at the University of Dundee, 20-24 September 1998. The topics covered include pattern formation in development biology, reaction-diffusion systems, intercellular systems and morphometrics, offering the reader a stimulating blend of theory and experiment. This book will be of particular interest to bio-mathematicians and development biologists. Paediatric clinicians, evolutionary biologists, orthodontists, anatomists, physiologists and many other members of the biology community will also benefit greatly from it. M.A.J. Chaplain is Co-Chief Editor, Journal of Theoretical Biology and works with the School of Mathematics and Statistics, University of St Andrews, St Andrews, Scotland. He received his PhD in Applied Mathematics from the University of Dundee in 1990, and then took up a lectureship position at the University of Bath. Problems of Development: The Microcosm and the Macrocosm. Development of the Vertebrate Limb: A Model for Growth and Patterning. Pattern Formation on Butterfly Wings. Turing Structures of the Second Kind. Pattern Formation Mechanisms in Skin and Hair: Some Experimental Tests. Some Mathematical Models for Biological Pattern Formation. Diversity in Pattern and Form of Biological Systems and Evolution: A Theoretical Approach. Developmental Morphologies Not Directly Specified by the Genome of the Individual. The Role of Chemotactic Cell Movement in Dictyostelium Morphogenesis. Angiogenesis: Experimental Data Relevant to Theoretical Analysis. Modelling the Growth and Form of Capillary Networks. On the Mechanochemical Theory of Biological Pattern Formation with Applications to Wound Healing and Angiogenesis. Statistics and Dynamics of Cellular Shape Changes. Shape Asymmetry and Developmental Stability. Invariance and Morphometrics: A Critical Appraisal of Statistical Techniques for Landmark Data. Statistical Shape Analysis and its Applications. Ontogeny and Phylogeny: Some Morphometric Approaches to the Skeletal Growth and Evolution. D'Arcy Thompson and the Problem of Biological Form. For further information about the editor Mark Chaplain click here.